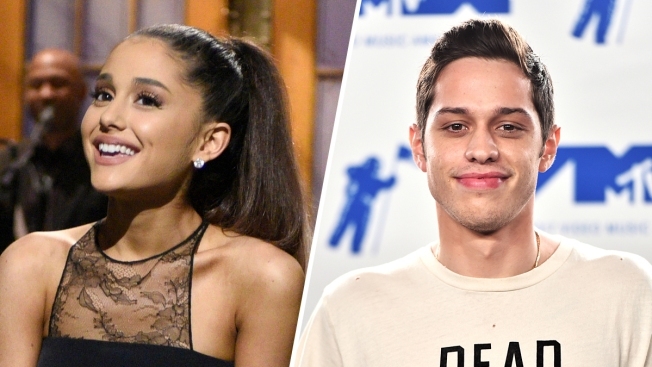 Ariana Grande and Pete Davidson are now Instagram official. One week after news broke that the "No Tears Left to Cry" singer is dating the "Saturday Night Live" star, the couple shared a photo together on social media. Davidson took to Instagram Wednesday to share a photo of him and Grande wearing matching Harry Potter robes. Davidson can be seen wearing a Gryffindor sweater while Grande dons a Slytherin one. Grande also shared a photo of the new couple on social media. Grande confirmed her split from rapper Mac Miller earlier this month. While Davidson and Cazzie David also recently broke up after two years together.